First Floor: pyjama lounge, 3 x Bedrooms (Master Bedroom en-suite with walk in closet), shared bathroom, double volumes, balcony, linen cupboard – What a charming and functional 4 bedroom double storey house plan! Nethouseplans brings you this beautiful Tuscan inspired home design to purchase as an 4 bedroom double storey house plan. As a magnificent example of an online house plan this home design demonstrates charm and exquisiteness in one simple package. This home is well equipped to suit in potential home owner’s needs or desires and will provide luxury and functionality simultaneously. This 396m2 online house plan provides a fantastic example of what a potential owner can expect to find when researching such stunning homes. A truly stylish home design, full of character. 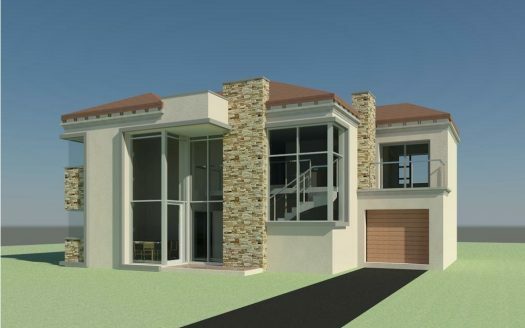 The ground floor of this 4 bedroom double storey house plan allows for the potential owner to directly enter the double car garage. From the garage, the owner enters directly into a spacious study with nearby guest water closet and access to a patio and the pool in the rear of the home. Through the entry hall the owner is immediately met with a stunning staircase leading to the first floor on the right. The lounge, guest bedroom with en-suite, dining room, kitchen with an island, and scullery are the remaining pieces of this magnificent 4 bedroom double storey house plan. The first floor of this well designed home holds three bedrooms. Separated by a private balcony and spacious family den, the master suite maintains its privacy from other the other bedrooms. The master suite is equipped with both a walk in closet and master en-suite. The two spare bedrooms both share a spacious bathroom. One of the spare bedrooms has access to the balcony and provides stunning views of natural beauty. Truly this is a fantastic home that will fulfill every homeowner’s dream.